The concept of a biorefinery is analogous to a petroleum refinery. A petroleum refinery uses the entire barrel of oil to produce transportation fuels, and everything from butane for cigarette lighters to asphalt, and a wide range of petro-chemicals used to make many materials including plastics. Nothing is wasted. The same is true for natural gas which has liquid byproducts and is the primary source for making plastics. The goal of a biorefinery is to utilize everything in the biomass-- leaving no waste. Another goal is to replace the products made in an oil refinery. However specific bio refineries can be tailored for individual feedstocks and desired output products. With Giant King Grass as a feedstock, one can use it for the processes described above, or a more customized approach can be taken. Giant King Grass when harvested tall at six months has 75% moisture content. In order to use it as fuel for a direct combustion power plant, one could squeeze the juice out using a sugar mill to create two product streams. One product stream is the relatively dry Giant King Grass press cake and the other is the Giant King Grass press juice. The press cake can be burned produce electricity, and the juice which contains nutrients can be put back on the fields as nutrient rich irrigation. The process of pressing out the juice in a sugar mill can be seen in this video. 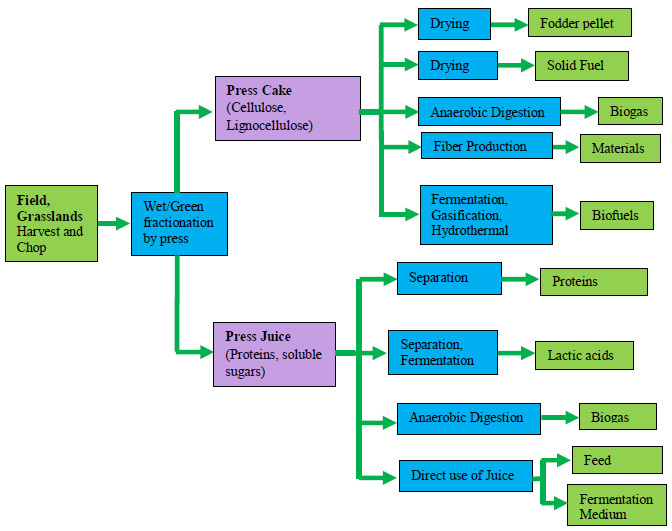 The chart below shows that there are many other options for both the press cake and the press juice in a biorefinery. Customized concept of a biorefinery for grass that emphasizes the solid and liquid parts separately. This view of a biorefinery emphasizes the value of grass to produce high-value animal feed, and amino acids and proteins, with the leftovers used for biofuels and electricity. The US and many other countries originally emphasized biofuels to replace gasoline and diesel fuel as the focus of biorefineries. These governments invested in R&D and subsidized building of commercial scale plants to produce biofuels. Governments also mandated blending of biofuels with gasoline which is another source of subsidy. The original biorefineries were simply modifications of ethanol production, originally developed for the alcoholic beverage industry, to produce large amounts of ethanol for transportation. In the US, the primary feedstock was corn and in other countries the feedstock was sugarcane. Soon there were outcries about using food for fuel, and governments expanded their subsidy programs to cellulosic ethanol and other biofuels derived from nonfood feedstocks. The initial cellulosic feedstock of choice were corn Stover, the rest of the corn plant after the kernels are harvested, and sugarcane bagasse and trash, the parts of the sugarcane not used in sugar production. Demonstration and initial commercial scale cellulosic ethanol plants were set up close to existing corn grain and sugarcane ethanol plants in order to utilize the existing infrastructure and nearby supply of feedstocks. Other nonfood crops such as perennial grasses are also suitable feedstocks for cellulosic biofuels. Given the large government focus and subsidy for cellulosic biofuels, entrepreneurs backed by venture capitalists and private investors started many companies based on innovations in biomass conversion technologies. Cellulosic ethanol has received the most attention, but other fuels such as butanol are being developed as well. Substantial progress has been made and several cellulosic ethanol plants are in operation. They are still dependent on government mandates for cellulosic biofuels which subsidizes the price of cellulosic ethanol. Even with mandates, loan guarantees and subsidies, the cellulosic biofuel plants have difficulty turning a profit. A major lesson learned from the cellulosic biofuel efforts is that there are other higher value products that can be produced from their processes, and that these products must be monetized in order for their cellulosic biofuel plants to be profitable. Biofuels are high-volume, but not high profit. This lesson has sparked the interest in biorefineries. 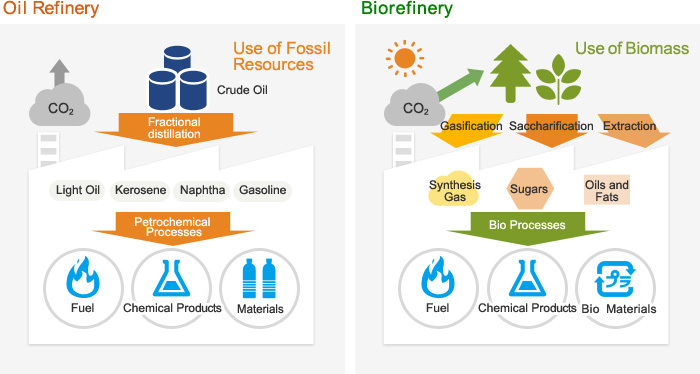 By producing multiple products, a biorefinery can take advantage of the differences in biomass components and intermediates and maximize the value derived from the biomass feedstock. A biorefinery might, for example, produce one or several low-volume, but high-value, chemical products and a low-value, but high-volume liquid transportation fuel, while generating electricity and process heat for its own use and perhaps enough for sale of electricity. The high-value products enhance profitability, the high-volume fuel helps meet national energy needs, and the power production reduces costs and avoids greenhouse-gas emissions. High-value chemicals produced in a biorefinery can be used to make plastics, replace nylon, and make detergents, antibiotics, cosmetics, sweeteners, flavors and fragrances. Protein can be recovered and used for food and feed ingredients. Cellulosic feedstocks are non-food based feedstocks that include crop residues, wood residues, yard waste, and dedicated energy crops such as Giant King Grass. These feedstocks are composed of cellulose, hemicellulose, and lignin. Cellulose and hemicellulose are made up of complex sugars, but it is more challenging to release the sugars in these feedstocks for conversion to biofuels and chemicals. Many companies are building their first commercial plants to implement processes for large scale production of second-generation biofuels, biochemicals and bioplastics. Cellulosic feedstocks offer several advantages over starch (corn) and sugar-based feedstocks. They are cheaper and more abundant so they provide a solution for producing more substantial amounts of biofuels and biochemicals to replace fossil fuels. The feedstock costs are lower, but currently the conversion costs are higher than the simple fermentation of corn and sugar from sugarcane. In the US, ethanol producers that use corn as a feedstock for first-generation bioethanol are building cellulosic ethanol plants adjacent to their corn grain ethanol plants. The cellulosic feedstock they plan to use is corn straw (corn Stover) -- the leaves, stalk and cob of the corn plant. All of their processes are developed and optimized for corn straw. 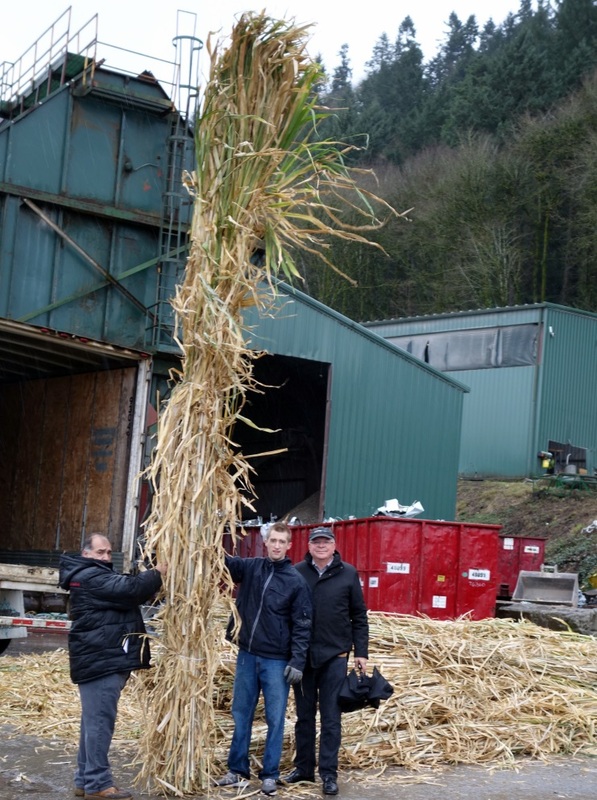 Four companies in the cellulosic ethanol business including POET and Novozymes have independently tested Giant King Grass as a feedstock for cellulosic ethanol production. The average results are shown below and compared to Corn Stover which is their baseline feedstock. The companies independently measured the sugar, lignin and ash composition of completely dried Giant King Grass samples. Glucan, Xylan and Arabinan are polymer sugars which are desirable, and lignin and ash are undesirable for cellulosic ethanol (but lignin has other uses). The data shows that one dry ton of Giant King Grass is as good (or better) than a ton of Corn Stover in terms of its sugar content which is key for producing cellulosic ethanol through fermentation processes. The companies also conducted pretreatment and enzymatic hydrolysis, measured the sugar production and projected the ethanol production to be 78.5-80 gallons per dry ton which is shown in the figure below. estimated independently by two companies. The unit is gallons per dry ton of Giant King Grass. The primary dry component of plant matter is lignocellulose a mixture of cellulose which yields Glucan a polymer of glucose--a C5 sugar; hemicellulose which yields Xylan (xylose) and Arabinan (arabinose) which are C6 sugars; lignin, an organic polymer that gives the plant the strength to stand upright, and ash. 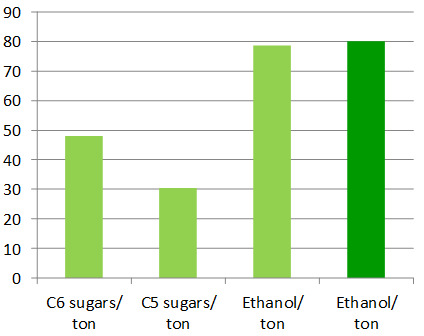 The sugar and ethanol yields are comparable to corn Stover. Basically a dry ton of Giant King Grass is as good as or better than a dry ton of corn Stover for cellulosic sugar production. The cellulosic sugars are starting point for cellulosic biofuels, and also for bioplastics and biochemicals. Giant King Grass has 8-10 times the yield per acre compared to Corn Stover. The comparison isn't entirely apples to apples because corn will grow in cold areas and Giant King Grass is a tropical and subtropical crop that does not grow in freezing areas. Nevertheless the advantage of Giant King Grass is clear. Multiplying the ethanol yield times the grass yield gives you the land use efficiency in terms of gallons of ethanol per acre of land. This is shown in the figure below. For reference the data for corn grain and corn Stover ethanol production in the US and sugarcane ethanol production in Brazil is also included. 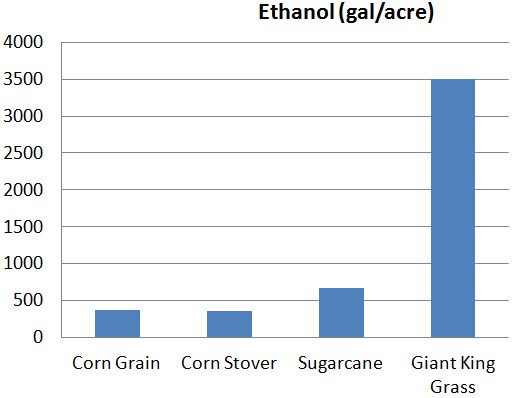 King Grass results in much higher ethanol production per acre. Feedstock is the largest component in the cost of cellulosic ethanol. The high yield of Giant King Grass can lower feedstock costs substantially and co-location of the biorefinery and the Giant King Grass plantation can reduce costs additionally. Together, feedstock costs could be reduced by 40 to 50% which would make cellulosic biofuels and other biorefinery products profitable.